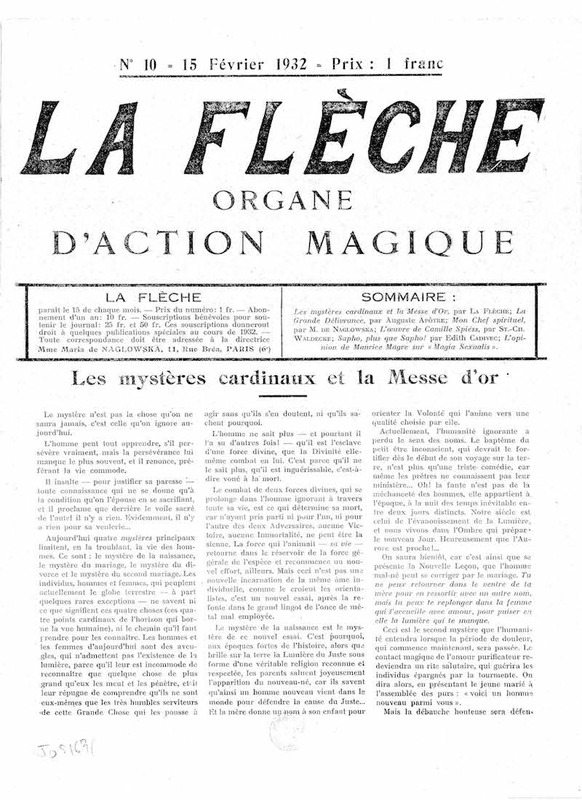 Organ d'Action Magique / Lumière occulte = Lances sociales = Perles litteraires. Paris, France. Language: French. Editor: Marie de Naglowska. 1/1, October 15, 1930-January 15, 1935(?) 4-8 pp., 10 francs a year. The journal is perhaps best viewed as an extended advertisement for Naglowska's "Erotisme Initiatique," which was the sexual magic of P.B. Randolph with ritualistic additions of her own. The journal claimed that" it had been created to prepare humanity through new idea-forms for the erection of the Temple of the third Term of the Trinity in which the Masses of Gold would be celebrated." The first issue carried an article by Giulio Evola. On Naglowska, see Sarane Alexandrian, "Maria de Naglowska et le satanisme feminin," in Les Liberateurs de l'Amour (Paris: Editions du Seuil (1977), 185-206. Rene Guenon in Voile d'Isis, January 1932, noted suspect tendencies in the journal! BNF.